I originally wrote this post in September... and now it's January 14, 2017. Regardless, here's my first travel post from NYC. This last summer, I got to tag along on a business trip to NYC with my husband. I’d only been to NYC once before, with a marketing class in high school. It was a magical experience, as we went during the month of December and all of the holiday decorations were up… AND there was snow on the ground. Pure magic. Not going to lie, NYC in the middle of July was hot and humid as hell. However, I would definitely take that over freezing temps and the millions of layers I had to wear on my first trip to NYC. What can I say? This Oregonian loves the heat. We had a full packed schedule in the 8 nights and 9 days we were there. No surprise, I’m sure. If you know me, you know that I am equipped with a mile long list of places to eat/drink and things to see/do in every city I venture to. NYC was no exception. I’m happy to report back that I ticked off at least 70% of the places on my list. I know, I know…my husband is a saint to put up with me. When we travel, I am NON-STOP. Anyways, moving on to the photos. That’s what you came here for right? I thought so. and headed out for doughnuts and coffee. My husband and I rarely watch the Food Network (we're not opposed to it by any means, but we just don't?) but this one evening we found ourselves watching this show about desserts. The hosts were making our mouths water with the way they talked about the doughnuts from Doughnut Plant in NYC. So of course we had to go. We tried the carrot cake, creme brûlée and chocolate hazelnut. They were so good, and this definitely wasn't our last time having one before leaving NYC... Whoops! Next Stop, coffee at The High Line Hotel. 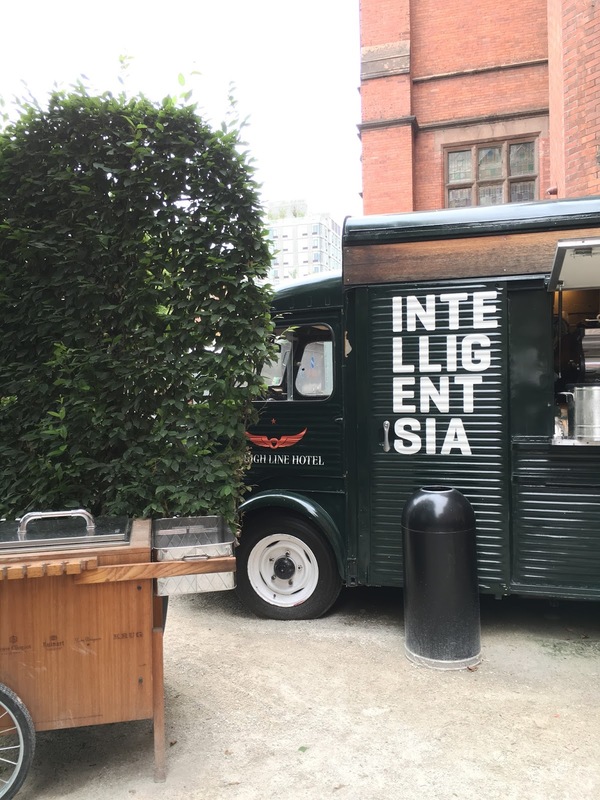 They have a cute little truck outside of the hotel that serves Intelligentsia. 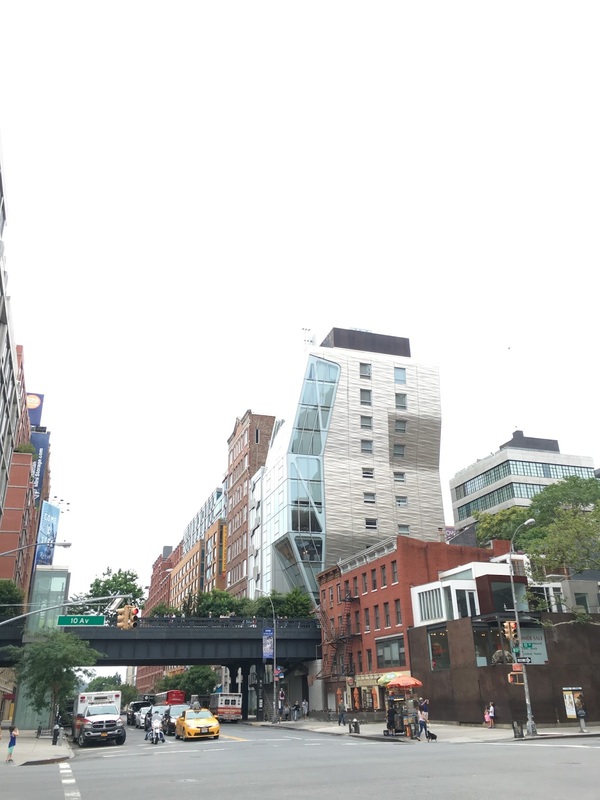 we decided to walk along the High Line. to the best place in Chelsea to do that: The Chelsea Market. After perusing all of the food stalls in the market, we settled on The Lobster Place. 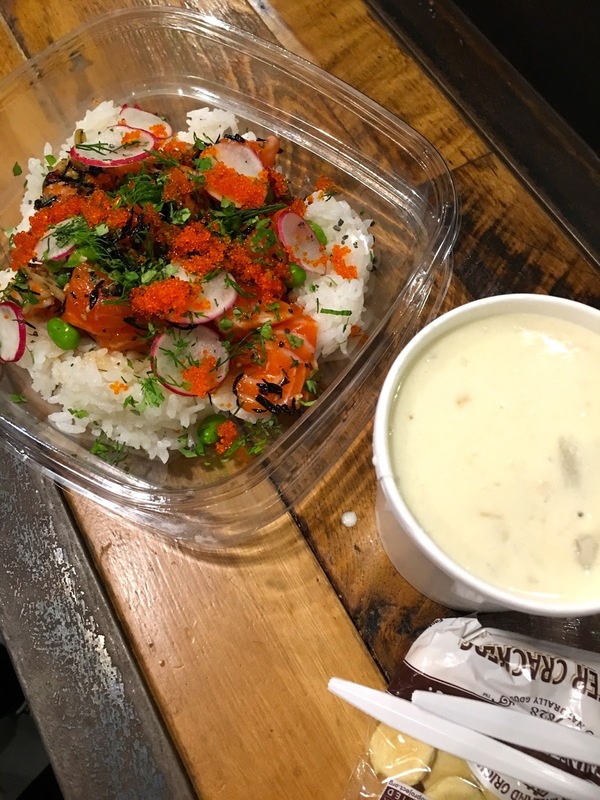 We had New England clam chowder and a salmon poke salad. Highly recommend it! To continue reading, click "read more" below! After a night of not sleeping, hours of walking, we headed back to the hotel to take a nap. Later that evening, we ventured out to Times Square with my husband's co-workers and found ourselves at this cute Italian restaurant. We stuffed ourselves with pasta and washed it down with red wine. Perfect first day in NYC if you ask me... Even if we were caught in a complete downpour on our way back to the hotel that evening. I have never in my life been caught in rain like that, not even in Oregon. Our clothes, shoes and hair were completely drenched. It was like we got in the shower fully clothed. It was kind of comical.